Not so much progress in terms of word count on the new book, just 8,000 or so since the last update, but there has still been some major progress. There have been two major plot changes in the past few days – the story is still going to the same destination but now it’s going by different (and more interesting routes). Luckily this all changed just before I was going to write those sections, not after. The other major change I’m considering is chopping a whole thread out – a complete character. Not because there’s anything wrong with what I’ve written, but the character is developing ideas and a story thread that will be vital to book five. Taking that into account, and some of the invaluable feedback I’ve had about Tainted Universe, I’m thinking it would be better to move all of that thread into the final book. I’m not 100% sure yet, but it’s looking pretty certain as things stand. 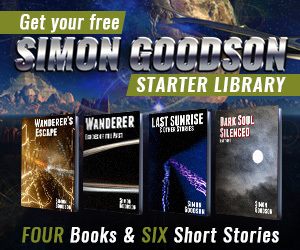 Simon, I have really enjoy the first three books and am very much looking forward to reading the remaining two. I would love to see greater expansion of this universe, as I believe there is a lot of potential, I would like to see more covering Elizabeth, and maybe more from the Empire’s side. I suspect you don’t want to be compared to another without, but a good example of developing a universe is Orson Scott Card’s Shadow series which adds more to the Enders Universe. Anyway, keep writing, it’s been fantastic to read the series, good stories in an easy to read style, I flew through the first three books in about two weeks. I forgot to ask – if you haven’t already could you leave a review, especially for part one over at Amazon.com? I want to give the Dark Soul books a big push but it doesn’t have enough reviews for some of the book listing sites yet. Thanks. The fourth and fifth books expand on the universe but there’s still a huge amount that could be gone into. At the moment I’m not really sure where I will go once Wanderer book five is finished. I suspect I’ll be working on something completely new, but that doesn’t mean I won’t return to the Wanderer universe later on. Four books in a row in the same series is a lot though. I haven’t read the Shadow series so will take a look at that. In fact I only read Ender’s Game a few months ago – because I read Speaker For The Dead lots of times and its one of my favourites I found it hard to go back. Now I need to re-read it and move on to the later books. Simon, after reading the three books, Thank you!! I am hooked. So well written, a great pace, fantastic characters and a fantastic plot with plenty of twists and intrigue mixed into the adventure. Cannot wait until book four and I all ready know book five will be on the shopping list. Again thank you for providing a great escape to the daily rat race. Clive Cussler and tom clancy now have competition on my ereader! Keep up the good work. Looking forward to reading your other books after these. Thanks Chris – really great to hear you enjoyed them so much. Book four is shaping up to be great, though at the moment I think it may be longer than I’d first thought (and so be finished a bit later). I should be sticking up a new update sometime this week.